I love a great interview, and Michael Toney has compiled in-depth stories from a collection of figures in metal. He’s not afraid to ask things that other interviewers wouldn’t touch, and through his book I learned a lot about his subjects. While reading this (funny moment: reading at Bourgeois Pig when Tracii Guns mentions it in his interview), I found myself gasping a few times. 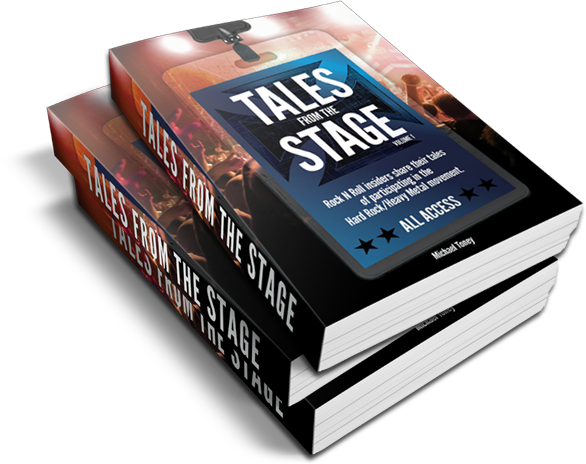 Check out my below interview with Tales From the Stage author Michael Toney. HardRockChick: How did you choose who you wanted to interview? Michael Toney: I did my best to include the musicians that I listened to growing up. I have been a serious fan of heavy metal since the early 80s, and listened to a lot of stuff that wasn’t considered main stream. Armored Saint, and Malice were two of the bands I was a huge fan of, so when Jeff Duncan and Jay Reynolds jumped on board I was pretty excited. I did, however, include some people that I had just recently become a fan of. Tracii Guns, and Brian Tichy for example. I should also mention that I did my best to make it a well rounded group of participants, with Eddie Truck and Brian Slagel representing the “non-musician” portion of the industry. As I mentioned in the book’s Introduction, I tried and tried, but was unable to secure a bass player for Volume #1. HRC: Was there anyone you wanted to interview that you couldn’t? MT: Yes, there were a few. The first that comes to mind is Jake E. Lee. He is a very private guy, but I wouldn’t totally rule him out for Volume #2. Rudy Sarzo, and Michael Anthony as well. Keep in mind, that I didn’t give these guys the standard 15 minute interview questions. Most of the interviews were well over an hour long. I was upfront with all of the participants from the start letting them know that I was going to get very personal with the questions. That alone can cause people to not want to participate in the project. HRC: You mentioned that you heavily researched your questions. What were your sources? MT: Some of the questions are very specific. That was a lot of work, and a lot of fun as well. The musicians that I have been a fan of for decades were fairly easy. Basically, I got to grill these guys I have been fans of for years on anything and everything. That being said, I put 10-20 hours of research into each person’s interview. I used the internet primarily, but I referenced many books as well during the interview process. HRC: You cover some usually off-limits topics- money and politics…I’m surprised you didn’t ask about religion! Did anyone hesitate to answer? MT: Surprisingly, no! Here’s the deal on that. Each one of the people in the book has done hundreds of interviews. 99% of those interviews took 15-20 minutes and covered similar topics. In order to keep the content fresh and entertaining, I had to take it an extra step. My goal was for the reader to totally connect with the person being interviewed. So, we do cover their career in detail, but we also dive into their finances, cars, house, current and past drug use, and more. Chris Holmes from WASP was brutally honest with everything, even STD’s! As for religion, we’ll be using that one in Volume #2! HRC: Did any subject make you nervous to interview? MT: (pause) Well, no…but, interviewing Eddie Trunk was intimidating for the first couple minutes. This guy is a professional interviewer, so I knew that he might be critical, but we got along great. I think he could tell that I had done my homework, and he ended up being an awesome person to interview. We still communicate a few times a month, and had dinner in Las Vegas a few months back. HRC: What was the most surprising thing you learned through this? MT: That just because a musician plays in front of tens of thousands of fans at festivals, has been featured on 20 albums, and does interviews regularly doesn’t mean that they drive a new Ferrari, and live in a house in the hills. Most lead very modest lives. Also, most of the participants shine light on how their publishing deals worked. I learned a lot about that side of the business, and found it incredibly intriguing. Chris Holmes, Bruce Kulick, Oz Fox, Ron Keel, Herman Rarebell, and Ripper Owens share some awesome stories regarding their publishing. HRC: The statistics you put at the front of the book are really interesting. As a researcher, I’m interested in why you decided to do that? MT: Funny you bring that up. It was a total “throw-in” at the last minute! I realized that I had asked 10-12 of the exact same questions to each participant. I got to wondering if there was a method or trend to their answers, so I put those stats together. I get comments nearly every day about them, but they are purely for entertainment. It’s certainly not scientific data. HRC: Based on your bio up front, it seemed like you went from hotel management straight to this. How were you able to get this level of access with seemingly little experience under your belt? MT: That is exactly what happened, and that is a good question. For the last ten years of my career, I was in an upper management position within the hotel industry and perhaps some of my professional experience helped me in obtaining access to the participants. I don’t want to paint the picture that it was easy, and that I had everyone locked in a week after I started the project. That’s far from the truth. But I hope that my persistence and maybe my professionalism allowed me to be taken seriously. I’m sure there was a fair amount of luck thrown in there as well. HRC: Would you say there’s a “moral of the story” you learned through these musician interviews? MT: This will sound very cliché, but you can do anything you want to do. My professional life used to consists of meetings, budgets, forecasting, and more meetings. Now, I talk shop with Eddie Trunk, grab a bite to eat with Chris Holmes, check out bands with Jeff Duncan, visit regularly with Ron Keel and Paul Shortino, and hang out with Bruce Kulick when he is in town. The book participants are good people, and I believe that I have made some life-long friends through this process. HRC: What’s next for you?